Home Run Derby was the name of a 1960 television show held at Wrigley Field in Los Angeles pitting sluggers against each other in 9-inning home run contests. The rules were not unlike modern Home Run Derbies; however, the television show also added as an out any called strike. 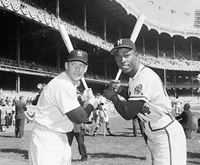 The series aired in syndication from January 9 to July 2, 1960 and helped inspire the Home Run Derby event that is now held the day before the annual Major League Baseball All-Star Game. Batters were given three outs per inning, and the player with the most home runs after nine innings wins. If the players were tied after that time, the derby would go into extra innings as per regular baseball. The winner received $2,000 and was invited back for the next week's episode against a new opponent. The loser received $1,000. There was extra money awarded in certain cases however. If a batter three home runs in a row, he would receive a $500 bonus. A fourth home run in a row would be worth another $500 bonus. Any consecutive home runs hit beyond that would each be worth $1,000. It is believed that Jackie Jensen was the only player to hit more than three home runs in a row (he hit 5). He still lost the contest to Mickey Mantle though. The original series is intact, having been rerun on ESPN from December 17 to 28, 1988 and July 10 to October 28, 1989. The series proved popular and was credited in part with the establishment of a classic sports network, which would eventually become ESPN Classic. In 2007, MGM Home Entertainment released the 1960 series on in a three DVD box set. 1960 episodes are also available via the iTunes Store. In 2003 and 2004, the Major League Baseball Players Association held similar contests at Cashman Field in Las Vegas, Nevada. The contests were held just before spring training, consisted of eight-man elimination tournaments, and were televised on ESPN. Instead of nine innings as in the original, contests lasted for only five innings. José Canseco won the first of the events, but low ratings led to the demise of the competition.